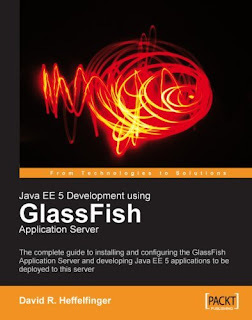 "Java EE 5 Development using GlassFish Application Server"
autorstwa Davida R. Heffelfingera. Poniżej przedstawiam recenzję tej pozycji. Recenzja jest po angielsku - takie wymogi wydawnictwa, które wspomaga bibliotekę książkami. I newer used GlassFish application server so I was really curious about it's features. Reading a book about GlassFish could have been a great possibility to familiarize with it's capabilities. Could have been, but haven't. After first look on the table of contents I realized, that this book is rather about Java EE 5 Development than about Development using GlassFish Application Server. The glass fish on the cover misled me. "select max(customer_id) + 1 from customers"
Generally speaking Java EE 5 Development using GlassFish Application Server by David R. Heffelfinger is a solid 400 pages book about J2EE. If you want to know GlassFish Application Server in details, you will be disappointed, but if you are a newbie in J2EE you will spent a lot of interesting evenings with it. Even more than with one of your girlfriends.